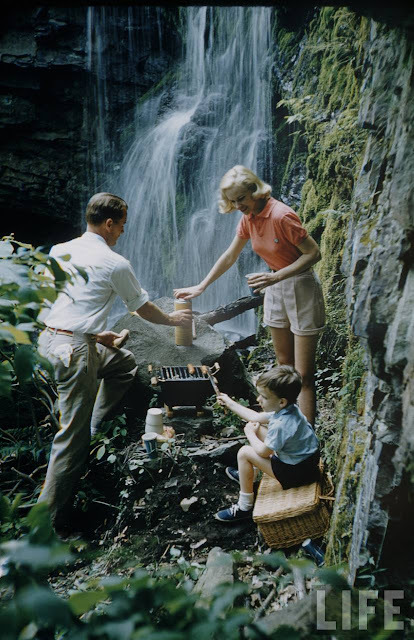 Picknicking In America by Leanord McCombe for Life. Since last updating this space I have driven approximately one million kilometres, cleaned approximately seven metres of ripe compost from the backseat of the car and grown at least twenty eight new grey hairs - not yet, I hasten to add, in the Bermuda Lady Triangle (bragging). Also, am giving up on trying to format this blog post. Code is not my friend today. Please just take the weird pauses, stuttering prose and awkward transitions as a little taste of what it’s like to hang with me in real life. Plans are afoot for our move to France for a year in August. We’ve rented a place in a small medieval town called Sommieres and I am so excited I have light bladder leakage at all times. Much to do though - more on the list than there are hours in the day. Keith and I are good. Trying to carve out moments to watch House of Cards and rant about Trump to each other in the hallways. We have gathered a massive pile of documents for our French visas - there must be 100 pages of paperwork in all - but we cannot by any means make contact with the consulate. Still, I am trying to find it all a comedy. Ha ha! See the lady smile! See smile not reach the lady’s eyes! See the lady cry and smile! See the French man laugh! See him throw his baguette in the air! My book is coming along, I got a lot done in Fiji and even though it is still a massive unwieldy beast that I feel will never be finished, it’s forming more shape and structure all the time. The children are well. They keep making their stuffed animals sing a song they call ‘It All Revolves Around The Sausage’ which is disturbing but preferable to their other number ‘I Want To Be Annoying’ (sung in falsetto). Peanut remains obsessed with the Hunger Games. T-Bone is working on a board game called Warlords and Babies and borrowing lots of library books along the lines of ‘100 Most Disgusting Things In The Universe’. Pudding is writing a book called Unicorn and Fairy about two best friends who, over eight chapters so far, have been to the shop and bought a computer. It is a rollercoaster of non stop emotion. I made the mistake of stating an unpopular opinion on a Facebook page for women writers last week and got royally serviced up the jacksie for my troubles. It reminded me that I’m not cut out to be a provocateur, and also that the online world is not that civilised a place, which saddens me. I’ll leave the debate to the feisty youngsters and keep my mouth shut in the corner. However, I am reading lots of lovely books in the bath, the electric blanket has appeared, and hot-chocolate -afternoon-tea season has begun, so winter is going alright by me. In short, all good in the hood. I hope the same is true for you all out there.